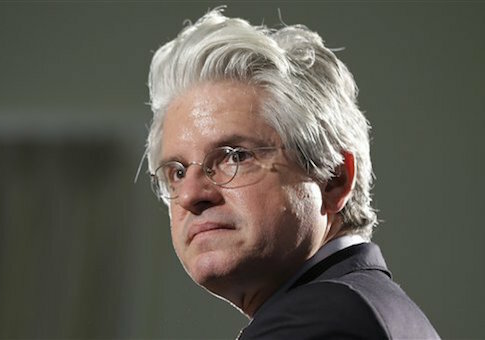 Democratic operative David Brock wants to charge users for a "Twitter-like" website exclusively for progressives, one of his many ideas to monetize his network of political advocacy and nonprofit groups, internal documents reveal. For a fee, visitors to Brock's Shareblue website will gain access to an exclusive knock-off of the popular social network, one "free from conservative trolls and harassment." The plan is one of eight revenue-generation ideas pitched to donors at a retreat in Florida over the weekend. Brock assembled wealthy liberals at the conference to plot political strategy in the Trump era and promote four organizations that he founded or currently oversees. One of those groups is Shareblue, and its mission is not just political: documents from the conference obtained by the Washington Free Beacon show that it is also determined to make money. "Impact and monetization are not mutually exclusive at Shareblue," the documents state. Eighty percent of the website is owned by True Blue Media, LLC, a Delaware corporation wholly owned by Brock, who in Nov. 2015 acquired his stake in the site from Australian firm MOKO Social Media, which still owns the remaining 20 percent. At the weekend conference, Brock announced that left-wing journalist David Sirota, formerly an editor of the International Business Times, would be the website's new chief executive. Its 2017 budget is $2 million, covering 18 employees, six of them full-time. Brock is turning Shareblue, formerly Blue Nation Review, into an integral component of his well-funded political machine. The site pledges to "weaponize oppo research," "to expose Trump and his allies and collaborators, and to damage Trump." Beyond its political mission, Brock hopes that Shareblue will also be a means of generating revenue, he told donors at the conference. "In the second half of 2017 we will move the focus to monetization with the goal of bringing in revenue in Q2 of 2018," the donor pitch stated, outlining eight strategies for doing so. One of them is Brock's idea for a "Twitter-like" website, which he said would be "a powerful way of merging our connection to the grassroots with our platform." The site also plans to sell access to Shareblue executives and contributors. "We'll develop event programming in major markets that features Shareblue editors, writers, and contributors, and generate revenue from paid sponsorships and/or consumer sales," the document explains. Other revenue generation ideas are more typical of a digital news outfit. Brock plans to sell "sponsored content" on the site, whereby advertisers would pay Shareblue for articles that "promote [their] businesses and organizations." The site will also sell "sponsored verticals," or sections of the website "that can be sold to businesses and organizations that align with our editorial priorities, e.g. labor, environmental organizations, anti-corruption advocates." The native social media platform might also be paired with additional "premium" content accessible only to paid subscribers, such as exclusive daily newsletters. To generate additional revenue, the website plans to sell user data ("Shareblue will always safeguard the privacy of its readers," it promises), rent its email list to political advertisers, and sell memorabilia that "capture[s] the emotion of the resistance." All of these ideas will pad the bottom line of a company majority-owned by Brock, and Shareblue plans to use non-profit arms of his political network to create Shareblue content and otherwise complement its activities. A primary source of website content, documents note, will be opposition research from American Bridge, the Super PAC-dark money hybrid founded and run by Brock. "Shareblue is positioned to frame opposition research from American Bridge and other progressive groups … and disseminate it directly to our followers in a daily inline persuasion campaign," the documents note. Brock chairs Bridge's 501(c)(4) dark money arm and draws a salary from its super PAC, public records show. That poses a potential conflict of interest if Bridge directly provides research to Shareblue, according to political law attorney Jason Torchinsky. "Most likely on the 990 some compensation to Brock or the details of the arrangements will have to be disclosed," Torchinsky said in an email. However, "as long as the agreement is at or below market rates and Brock recuses himself from board votes about compensation, there likely won't be any real legal issue." There is no such disclosure in 2015 tax filings for the American Bridge 21st Century Foundation, the group's dark money arm, but that filing only covers a month of Brock's Shareblue ownership, meaning there might not have been any transactions that year that merited disclosure. Shareblue also plans to collaborate with the American Independent, a 501(c)(3) nonprofit news organization run by Brock. That group's latest publicly available tax filing only covers 2014.